Alyssa Danna’s process is intuitive and subconscious. She pulls together discarded, found objects and uses sculptural techniques to compose an installation. Methods vary between long, laborious, detailed-oriented work, and quick, structural adjustments. While she builds a piece, she steps back. She edits. She is led in one direction or another based on aesthetics or unpredictable surprises that come up in the process. And while a considerable portion of the installation might consist of found objects, there is a controlling hand guiding the composition and manipulating pieces to make a work that even Danna does not always know is coming about. The discovery of someone’s unwanted item serves as a foundation for Danna to consider consumption, to muddy the narrative of the object, and to push material boundaries. She has a hyper-ability to create symbiotic relationships between objects, in which a viewer is unable to decipher where the melding of elements within her creation begins and ends. This allows Danna to look at the old and new, or more precisely the discarded and the renewed, and go beyond the physical to investigate broader concepts surrounding these dichotomies. In the end, Danna’s completed work is often beautiful and ornate, exemplary of the Baroque, yet there is an underlying darkness, something grotesque fixed within the beauty. In this particular installation, Danna completed the work by including live snails, which in many ways serves as an apt example of Danna’s practice. Snails themselves are the attachment of two parts that appear strangely disjointed, yet seamless: they have intricate, collectible shells attached to eerie, slug bodies. Beyond these superficial observations, the snails, at the center of this complex piece, are powerful symbols for the work’s subtle message. The snails move about on top of an inflatable ball painted white with traces of the sphere’s original bright orange surface peeking through. The ball rests on the crown of a quasi-deconstructed chandelier placed underneath a skylight. Hovering precariously above the snails is a clear, glass bowl, slightly tipped and tied by beads with salt crystals growing inside and seemingly spilling out of the interior. The crystals have a mysterious, neon-blue tint, like miniature ice mountains frozen in time, but crumbling at the slightest touch. Below the snails, delicately suspended like a swing underneath, is a green compote vase, with a literal head of lettuce inside of it—a sphere of sustenance that, despite the fact that it could feed the creatures, is inaccessible unless a snail plummets off the ball’s surface. Meanwhile, the snails crawl over each other, and, oddly enough, toward the salt. This chandelier hangs directly below the center of the skylight with dozens of thin, white threads delicately balancing the entire work below. It is completely tension fit as Danna relies on weight and gravity to steady the installation. It becomes an exercise in finding equilibrium—everything has a counter. These dichotomous relationships are in some instances clear. Salt serves as a symbol of danger or death for the snails, while the head of lettuce acts as a life source. Nevertheless, there are more subtle arrangements of pairs and opposites that occur throughout the piece. Behind the installation are two iridescent screens with drawn lace patterns, giving semblance of a backdrop—a vertical. 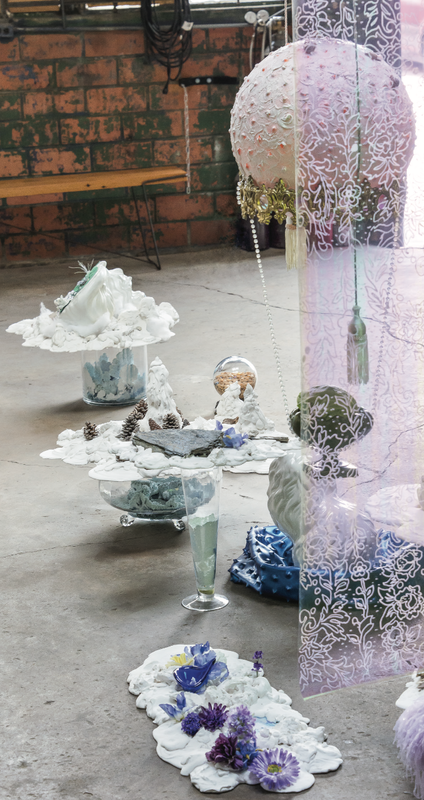 Along the floor are white plaster landscapes, like little islands, sitting on top of clear vases also filled with salt crystals—a horizontal. The landscape at the forefront has a turned-over cat, a dead porcelain pet gutted in the interior to evoke a cave filled with wonders, and even a much smaller cat perched inside. Further back, lingering between two landscapes, is another porcelain cat, this one sitting up and looking devious as it stands on a deflated blue ball, countering the inflated white/orange one above it. The cats, too, suggest life and death (or rebirth if one considers the smaller cat), as do the inflated versus deflated balls. Pulling back to the overall installation, there is an abundance of white that permeates the scene: white plaster, white paint, white cats, white salt crystals. The use of it seems futile in its environment—the work is installed between an active workshop that produces steel and wood fabrication to the left and an automotive repair garage to the right. The environment also evokes a strong contrast between what is stereotypically male and female. In the workshop are heavy materials and tools; in the garage are oils and loud machinery. Operating both worlds are men. But in between, the operation is female—not only in its maker, but in its material make-up filled with fragile elements and feminine clichés. While Danna intuitively sculpts a work saturated with eye-catching details, playing on our natural impulse to appreciate what is on the surface, in reality, she invites us to look again and examine the work more deeply. For instance, ironically, most snails are hermaphrodites, presenting an added layer to the discussion of balance and contrast with this creature that embodies opposites. 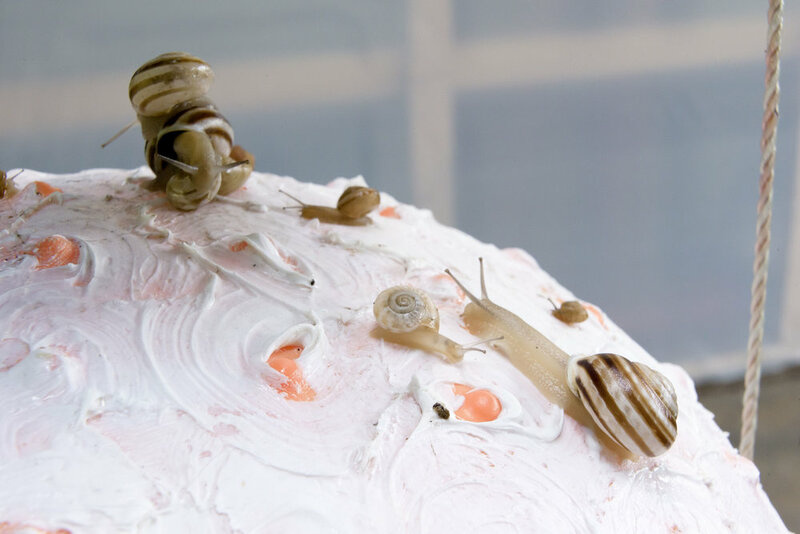 Moreover, Danna is an artist with a controlling hand, but the snails, and their unpredictable nature, provide an intriguing point of return, provoking a departure from these initial juxtaposing discoveries into a contemplation of more complex issues. It is here that we can shift from the fantastical to the sinister undercurrent present in the installation. The live snails on the inflatable ball never stop moving. They secrete trails of mucus to slide more easily across the terrain, leaving marks of their own making. They are delicate, easily crushed; yet they are strong, lifting ten times their bodyweight despite lacking a backbone. They can adapt and remain self-sufficient as they carry their house on their back, which grows right along with them. But they can easily be put in detrimental circumstances, such as being exposed to a horrific demise caused by the slightest bit of salt. Much of Danna’s work carries references to nature. 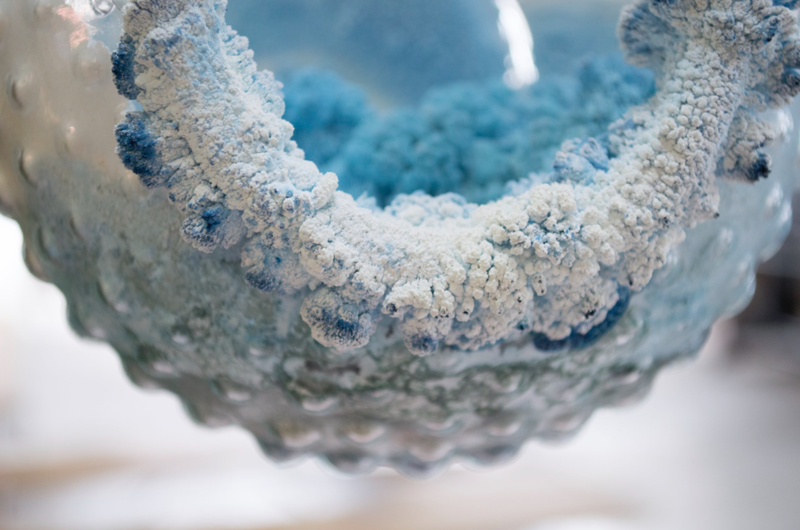 In past work, her smallest pieces include wasp nests colored with glass paint. Her largest piece is a 20-foot agave stalk suspended upside down from the ceiling like a chandelier. There are found objects that represent bees, birds, bunnies, cats, dogs, ducks, horses, or remnants of the natural with the use of feathers, hair, and seed pods. These physical manifestations are constant in her work. However, none of the aforementioned animals have been live in the sculptures they inhabit, and they have often come from a desire within Danna to take something decorative and familiar—and sometimes pathetic in its founding, like a once loved, tossed aside knick-knack—and re-instill in it a sense of lost value through a form of care and mending. This particular installation, while created in a similar way to other works, does not seem as earnest and hopeful, but rather elicits an air of foreboding circumstances. And whereas Danna’s previous work feels at home in its surroundings, this one does not. It is much more jarring in its existence in the space, despite its cohesiveness as a whole, leading one to consider what happens when two entities refuse symbiosis. The message feels two-fold as a reaction to the artist’s self—in which she recognizes that she is an other in this place—as well as a reaction to current events. It is set in a time when people appear to be shifting toward extremes with the most stubborn of stances, regardless of how detrimental those attitudes can be to themselves and to others. This absurd world of ours also lives in this installation, but its symbolism feels both present and futuristic, a beautiful dystopia. We are in an unsustainable situation now, in relation to our environment and to how we treat each other, inevitably leading to the question of what an untenable world holds for us in the future. The snails are hovering between elements that embody life and death, yet they are happily crawling toward the one thing that is sure to kill them. Is it too obvious to place ourselves in this analogy? Are we concerned more for our individual lives housed in our own shells, or our own pristine, white islands? While the snails crawling toward the salt may be an effort to get to the center of the inflatable ball to find their balance or to seek the point of least resistance, it is short-sighted. Are we guilty of the same desperation? Although the snails provide considerable meaning in the work, they did not propel the start of the entire installation. The snails, actually, were the final addition to the work. 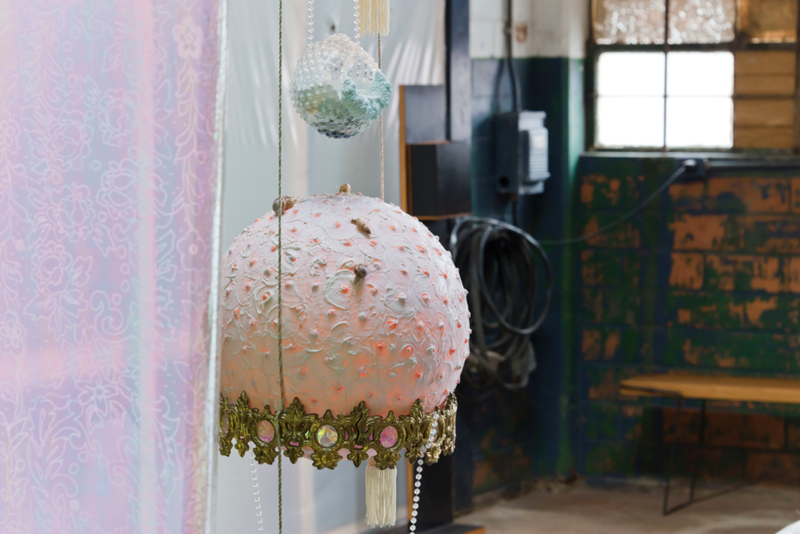 Instead, the beginning of Danna’s process came with the chandelier—a functional, somewhat broken piece in need of affection, and a found object that serves as a counter to the natural light beaming down through the building’s skylight. Circling back to this point of origin in Danna’s work, we find the first dichotomous relationship: two light sources, one natural, the other man-made. Most importantly, the chandelier holds everything below it—a delicate, impractical world, suspended in a fragile and uncertain state of equilibrium. This essay is included in the limited edition, hand-bound publication Alyssa Danna: An Impractical World released December 16, 2017, and produced by F&M Projects in conjunction with the installation presented at French & Michigan. Support F&M Projects and its program by collecting its publications and becoming a founding donor.